After Youths (under 19 years of age) have become members of the National American Iris Society (A.I.S. ), then what? Many adult AIS members go to monthly club meetings, but these can sometimes be "boring" for a 3rd grader. Many adult AIS members exhibit iris, but who helps the 2nd grader or the 8th grader elarn to do this? Many adult AIS members hybridize iris, but what does that mean to a 6th grader? AIS Region 4 (Maryland, District of Columbia, Virginia, West Virginia, and North Carolina) a hybridizer has a yearly hybridizing clinic for youth only, and then they get their seedpods to plant if it works! AIS Region 18 (Kansas, Missouri) has a Regional Contest that parallels the National Clarke Cosgrove Contest. Some local clubs have "youth only" shows -- some are judged and some are not. Other AIS Regions have special contests beside the National Youth Contests. Some clubs concentrate on youth participation in the artistic division on iris shows. AIS Region 13 has a Teacher Directed group of youth who are currently concentrating on the National AIS Essay Contest and National AIS Coloring Contest as a beginning. They also have an iris planting and will have guest speakers from their sponsoring Iris Club who will talk about different aspects of the iris. There are youth groups that concentrate on making posters for their Iris Club. Some youth groups take tours of iris gardens and/or commercial sources of the iris. Hopefully, the above list gives examples of the many projects available for the Youth Members of AIS. The National Youth Chairperson had ideas ready for mailing to participatinig Teachers, Youth Leaders, and Youth Advisors of Local Clubs. Becoming a Youth Member is the first step to receivng bulletins, booklets, and information handouts. 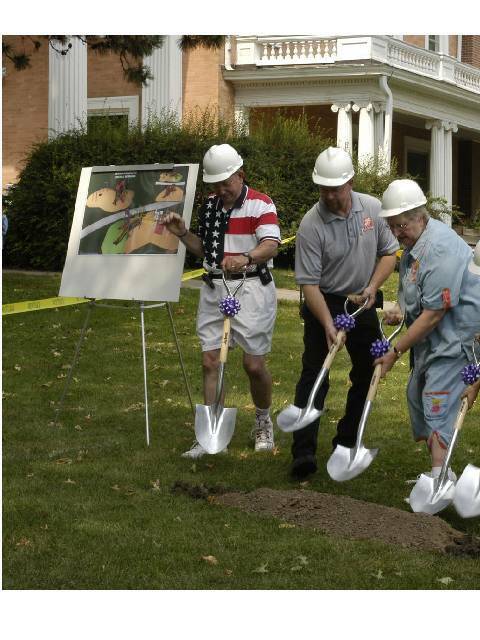 The photo below is from the JeffCo show on May 6th, 2006. 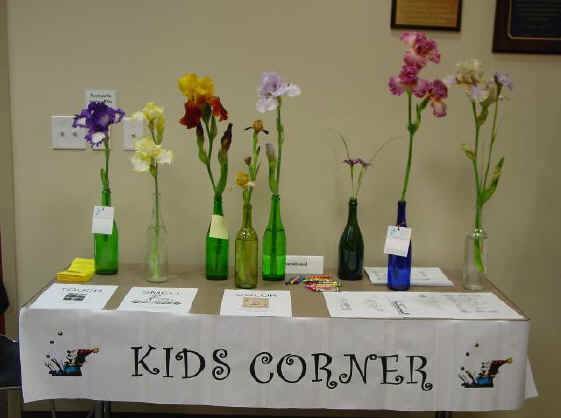 A youth from this Affiliate Society had a special table where kids could color iris pictures, touch the irises, leaves, etc, look at the pollen and learn about irises. Rita Gormley thought this was very successful and the idea came from the daffodil society. My name is Spencer Farley. I am twelve years old and a member of the Lincoln Iris Society in Lincoln, Nebraska. A special place in Lincoln for me is the Northeast Family Center in Whitehall Mansion. I've grown up going to the Mansion witih my mom for meetings and for special family gatherings. Whitehall Mansion is a great old house about a hundred years old. 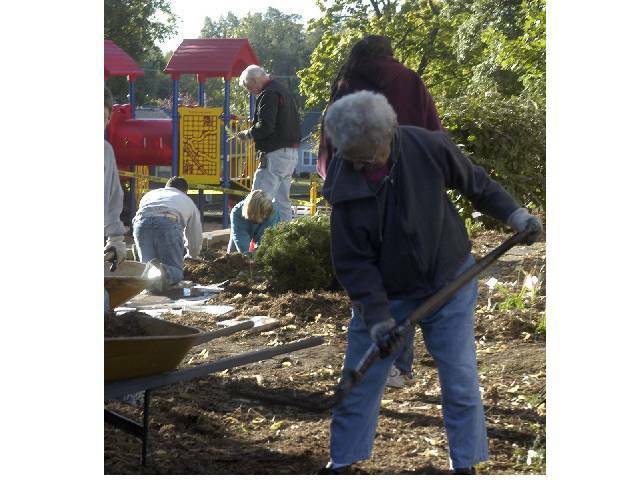 Two new playgrounds were being donated and I wanted to help. The installation was moved from the summer to fall during school hours. Since I couldn't help put the playground in, my mom and I tried to think of other ways to help. We came up with the idea of planting hybrid iris along the playground fence to help beautify the area. Our project started out small, but before we knew it our garden grew to 25 feet by 58 feet and would include plants and flowers that would bloom all season. With a project this big we needed help. I asked my fellow members in the Iris Society if they would be willing to help. I was a little nervous getting up and speaking to the whole group but they were wonderful! Not only did they agree to help, but they voted to donate money to the project! 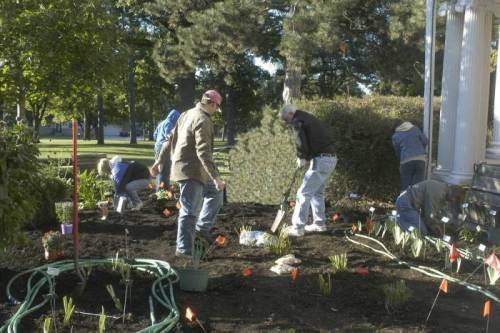 Members also donated hybrid iris, daylilies and other plants. I called on some local businesses to donate needed chemicals and flowering bulbs. We even got a park bench! 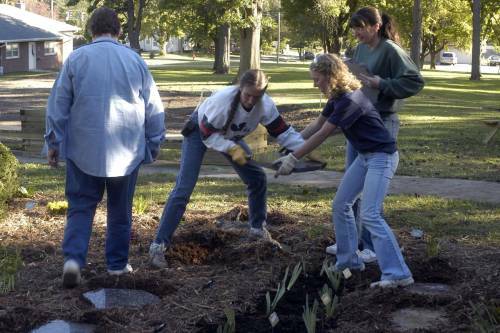 I am also a member of 4-H and the 4-H Teen Council helped shape and put granite stepping stones in the garden. It was really fun seeing all the people come together and work on the project. In all, we had nearly one hundred volunteers. Even my best friend, who has never gardened, helped! The garden has nearly 500 flowering bulbs, around two hundred iris, thirty hybrid daylilies and many other flowers and grasses. All donated. It was fun seeing the garden come together. Giving something back to the community. These children had a lot of fun planting this iris garden around the sign. All of the youth are grown now. This picture was taken by Judy Eckhoff in Hutchinson, Kansas -- Region 18.